On August 20, 2006, toxic waste was illegally exported from Europe by multinational trading company Trafigura and left in Akoudo, a dump site in the middle of a poor residential area of Abidjan, and in 18 other sites in the city. Tens of thousands of people suffered severe health effects and 15 to 17 people died. The waste was produced from unrefined gasoline by a process called caustic washing, a process banned by most countries. 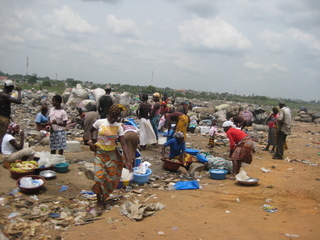 Ivorians staged protests and demonstrations in the city following the dumping. In Ivory Coast, the company paid the Ivorian government USD 195 million in settlement and became immune from prosecution. In 2010/11 a Dutch court found Trafigura guilty of the illegal export of waste from the Netherlands to Africa and for concealing the harmful nature of the waste for life and health. However, an out of court settlement requiring Trafigura to pay total 1.3 million euros ($1.7 million) in fines concluded the legal process in the Netherlands. No studies have been undertaken to assess the long-term health impacts of the waste and the exact composition of the waste has not been made public. Thousands of Ivorians are yet to receive compensation. Specific Commodities Waste From Caustic Washing Of Coker Naphta (Unrefined Petroleum); Sodium Hydroxide, Mercaptides, Sulphides, Phenolates, Organochlorines And Organic Chemicals Such As Benzene, Xylenes And Toluen. Project Details Trafigura carried out a caustic washing process involving coker naphta, on board a ship called the Probo Koala. Between 150 and 200 tonnes of caustic soda was used in washing. The company attempted to deliver the waste in Amsterdam, but the Amsterdam Port Services (APS) raised the price from 27 euros/metre 3 to 1000 euros/metre 3. It would have cost to Trafigura over US$ 630,000 to treat all the waste. In Ivory Coast, the company would pay US$30-35per m3 of waste. A total of 523 million m3 of toxic waste was dumped in Abidjan, affecting an estimated 100 000 people. According to the government, 109.5 hectares of crops belonging to 245 farmers was destroyed and 455 animals were culled to avoid contamination. Trafigura operates a fleet of up to 110 vessels traveling at any given time, carrying 6.5 million metric tonnes of liquid and 1.25 million metric tonnes of dry bulk cargo each month. In 2011 Trafiguras turnover was US$122 billion. Trafiguras annual turnover dwarfs the gross national product of many states. By way of comparison, in 2006, Trafiguras turnover was US$45 billion, while Ivory Coast had a gross national product of approximately US$ 18 billion. Other Neurological, cutaneous, respiratory, digestive, ENT (Ear, Nose and Throat) and opthalmological impacts, as well as in some cases, gynecological and cardiovascular problems. At high concentrations of waste, the effects can be very serious and include convulsions, coma and eventually, death. -EU and member states should adopt a normative framework requiring companies to respect human rights and the environment and carry out adequate human rights due diligence throughout their operations. They should also make it mandatory for companies to disclosure their lobbying activities and positions in relation to national or international regulatory frameworks. against all involved in the misappropriation of compensation funds; publically report on the changes made in law, regulation and practice in Ivory Coast to prevent the illicit import and/or disposal of hazardous waste; Amend the criminal code of Ivory Coast to allow for companies to be held legally accountable for criminal conduct; assess the legality of the Protocol daccord, including the immunity from prosecution given to Trafigura. Why? Explain briefly. Six years after the dumping of the waste, despite the huge numbers of people affected, international coverage of the issue and several legal proceedings, little has been done to strengthen national and international regulations to prevent similar incidents of dumping in the future. Trafigura still evades responsibility for the event. There are reports that the authorities in Ivory Coast failed to properly distribute compensation to victims. The Trafigura incident also led to superinjunctions in the UK preventing the media from reporting the issue thoroughly and having access to information. Trafigura has been convicted of illegally exporting waste in the Netherlands, but the Dutch courts decided that much of the substance of the allegations was beyond their jurisdiction. Trafigura was granted immunity from prosecution in Cote d Ivoire, as part of a local settlement. International organizations are calling for Trafigura to face a criminal trial in the UK. Greenpeace. The Toxic Truth. (September 25, 2012). Other Comments There is a lot of information for this particular case, not all of which could be mentioned above. The report by Greenpeace/Amnesty is the most detailed account, spanning a 3 year period.